Your race of faith was meant for more. RUN FAST Halfhearted Christianity is not Christianity. Serve God with ALL your heart. RUN FAR It’s not the start, but the end of the race that determines a winner. Be faithful to the end. RUN FAIR In this race of life, cheaters never win. Live with integrity. RUN FREE No weights, no hinderances, nothing slowing you down or holding you back - that’s running free. This DVD will radically help you in your Christian life especially if you are a youth. Rick Rhode’s passion for God and youth comes through very strongly. It’s presented ina way that is very challenging and easy to understand and apply. I am so thankful for the way God is using Rick and his ministry! 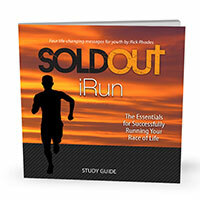 "Sold Out messages are clear Biblical teaching presented in a motivating style. Truth is taught with passion, openness and honesty, and God is using these sessions to convict and challenge people of all ages. We are finding this to be true in our church. Praise God!"